Barbie Spy Squad starts showing our main character of the best ever adventures: Barbie along with her friends Renee and Teresa are preparing hard to be a recognized gymnasts; each one of them know that teamwork is essential to achieve good results; however, Barbie sometimes has a small amount of doubt about their abilities and that makes her a little discouraged; nonetheless, her friends never judge her bad and encourage her to continue every day. Given the curiosity to see the secret door open, the youngsters access to it without measuring any kind of danger, within the site, they discover that it is a base of undercover secret agents dedicated to working in the country’s national security!, and that they are not there just by chance. 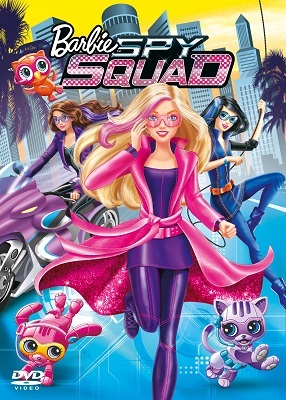 The girls are welcomed by the Special Agent Dunbar, who is also a secret agent and the real Barbie´s main antagonist; he explains´em that they are there to fullfill an important mission: to be trained to be spys and to help capture the burglar who stole one of the most important jewels of the world. 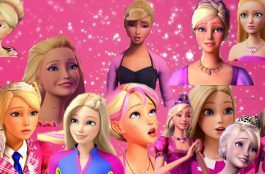 Their Gymnastics skills will be a key requirement for the mission to be successful, so, at that time Barbie´s, Renee´s, and Theresa´s training begins, Renee, and certain missions start to be assigned to them those of course are totally full of adventure and action missions. 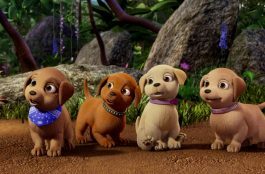 But in this mission, the friends are not alone: Violet and Percy are their companions, and they are artificial intelligence created by the spy agency to help its agents. 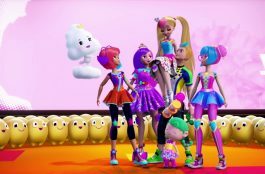 They will be very close to Barbie in order to assist her achieving her objectives; also they will be equipped with high-tech gadgets, costumes and various instruments that will make their job a little easier! 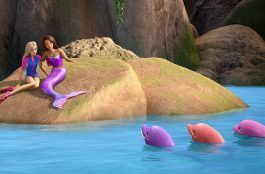 It’s time to show their skills and fight their opponents, including: Patricia, who was one of the companions at the Barbie´s training, but that will make things get a little tough once in the spy real mission. Patricia has feline green eyes and purple hair with some pink stripes, she wears a black bat-shaped jewerly mask and cat ears made with precious stones as well, her thief suit is a symbol of everything she has stolen and of what she can do moved by her ambition! Things are not simple for the spy squad, this time more than ever they must prove that they are not only outstanding gymnasts, but that they are also a courageous and able to safeguard the security of their country spys.